Risotto isn’t something that I make regularly in my house. I don’t know why. I guess because it just sounds so fancy and we are a pretty simple family. Fancy shmancy only happens when the kids spend the night with the grandparents and the husband and I cook steak and seared scallops for a date night in. Speaking of such, I need to pencil that in to our calendar this month. That sounds pretty lovely right about now, but I digress. It turns out, risotto really isn’t all that fancy. It only takes a few simple ingredients, and comes together rather quickly. You just have to stand over the stove and stir stir stir for twenty minutes, which may be a bit of a pain to you if you aren’t a fan of standing or you have children pulling on your legs. 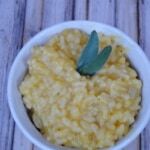 I chose to be all fall-inspired this time and flavored my risotto with pumpkin puree that I had leftover from when I roasted a pumpkin for pumpkin muffins. I had right at a cup left, which is the perfect amount to stir into this risotto right at the end to make it creamy and luscious. If you didn’t have leftover puree, I would still take the extra step and use a fresh pumpkin. It’s very easy. You just cut it in half and bake it in the oven for about an hour and a half and puree the flesh after it bakes. You could do this ahead of time to save on time the day you are making the risotto. My picky eater four year old was a fan, which I was thrilled with. He got lots of good broth in his system as well as a vegetable. You see, he thinks he doesn’t like vegetables, but he actually does. You could eat this as a main dish in itself, but I would serve it with a big salad or pan of roasted vegetables. You could also serve it as a side dish with something like a pan seared porkchop, chicken, or stuffed mushrooms for my vegetarian friends. All would be delightful. Whatever you do, celebrate the gift of fall. It truly is a lovely time of year. Add onion and garlic and cook until softened. Add broth 1/2 cup at a time. Stir each half cup until absorbed into the rice and add another 1/2 cup. Repeat this process, continually stirring for about 20 minutes. 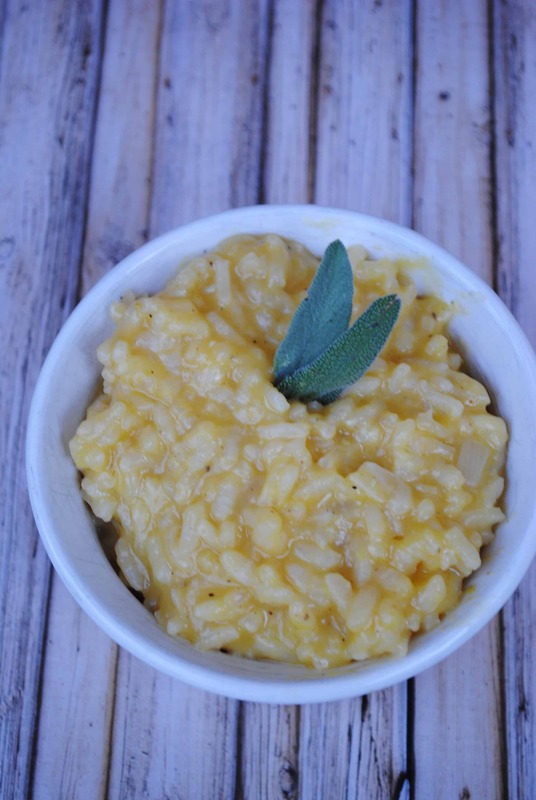 When rice is tender, stir in pumpkin, parmesan, salt and pepper and sage. Make sure you add enough salt so the flavors pop and it isn't bland.